Well, with the exception of a few more additions. But, the furniture and walls are pretty much in place. New addition - the loft bed. A friend from the theatre was done with it. It was originally painted red, yellow and blue (gross - boy colors, according to Laine). Blake painted it this salmony pink and gray. It also had a slide and a table attachment, however, they didn't fit in the room. So, we put the ladder in the slide's place and removed the table gear. That was fun......Laine seeing the slide not fit into her room and realizing she could not have it. I assured her that she'd have much bigger disappointments in life. Her new room is perfect. I loved her design before, but it ate up so much floor space in this tiny room. This arrangement allows her to sleep above and play below. We also removed the armoire that has been used for 2 babies......it was hard to do.....but I relocated everything into her closet. Another tight squeeze.....such is the life in a small house. I've got a blank wall here......which might house a small TV (on her dresser) so that the littles can play video games. I'm not a fan of TVs in kids' rooms, but we don't have a playroom in this house. Our kids have outgrown the need for a dedicated room to this stuff (no more plastic stuff everywhere!). But, they all want their own space....and video games in here means we can watch TV in the living room. I used to hang a "current" dress on her armoire door. Meaning, whatever the next occasion is.....a dress she'll wear to it would be out on display. Now, her closet door serves that purpose. Her back-to-school dress is up now. 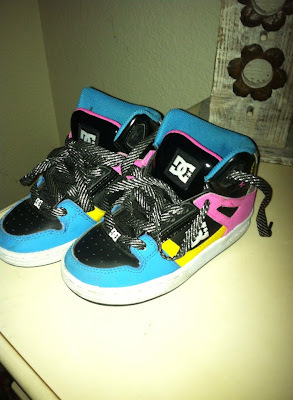 She will NOT be wearing it with these shoes, which she chose for school. Lord give me strength. Her gallery wall will be a work in progress. I still have LAINEY letters to hang and as I find things, I'm sure they'll be added or changed out. *Jillian is making cute curtains to hang from the bottom of the loft to create a playhouse underneath. I cannot wait to add this to it. *String lights will be added once the curtains are created so that she can have a glow underneath the bed. Start to finish, this cost us about $50. I bought the rug on clearance for $35 and the paint for the bed and frames in the gallery wall cost about $15. The frames were re-purposed from our art dealer neighbor. The remainder of the transformation came from taking things we already had in our house and adding them here. Now, both kids' rooms have loft beds which are really nice for a small house. Every square foot counts. We've lived in spaces two or three times as large as we have now......so we've had to make adjustments.......but we adore this house. Back soon with paint in the living room. Lots of house changes! It's PERFECT! I like it better than the inspiration room because of the gallery wall you did!! Good Job mama!! I love the loft bed idea. Now I am thinking how can I get rid of my daybed in MB's room! Not really but I love her room. Tell her I will get a mini crib so MB can come over and spend the night underneath. Btw, which accessories is she wearing with the back to school dress? I love it. It looks very fall/ Lilly Pulitzer. Navy headband and silver Toms. So stylish. Great job re-doing her room for super cheap. Plus, the new room is super cute! Adorable makeover! Love your inspiration bedroom too! This post confirms that Kamree eventually needs a loft bed because her room is small. She has bunkbeds now but we could use the space underneath! First Day - And, Life Changes In A Big Way!